I am always looking for ways to be a better human being, spending valuable time reading lots of interesting books and trying to think of ways I can connect with those around me. Problem is, with so much to read/do/remember and so little time to do it all, I really do struggle sometimes. For this reason I have added these very cool dice onto my 'wish list' from santa (A better list than the one suggested by 'GiveEmThis' featured in yesterday's post)... They are DiceForChange and are a beautifully simple and playful reminder to introduce new routines and actions into my life. 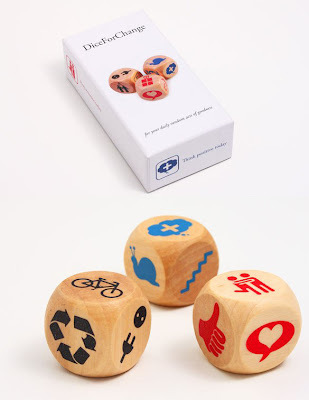 With the Eco, Kindness and Wellness Dice I'll be prompted to 'walk or cycle to work today', 'hug someone today', 'Think positive today' or best of all 'Slow down today'. There's the very tactile wooden variety or the apps versions you can buy via the itunes store. The dice are designed by the very inspiring 'creation studio' Creative Heroes in the Netherlands and join a suite of other products including Drive - a game designed for young visually impaired gamers. Love your work Creative Heroes!